A nice new feature of the upcoming iOS 6 firmware (coming this fall) is when updating apps from the App Store, the App Store app doesn’t close on you when you tap update or update all. Before, it would close after every time you tapped update or install causing you to have to reopen the App Store for each app. 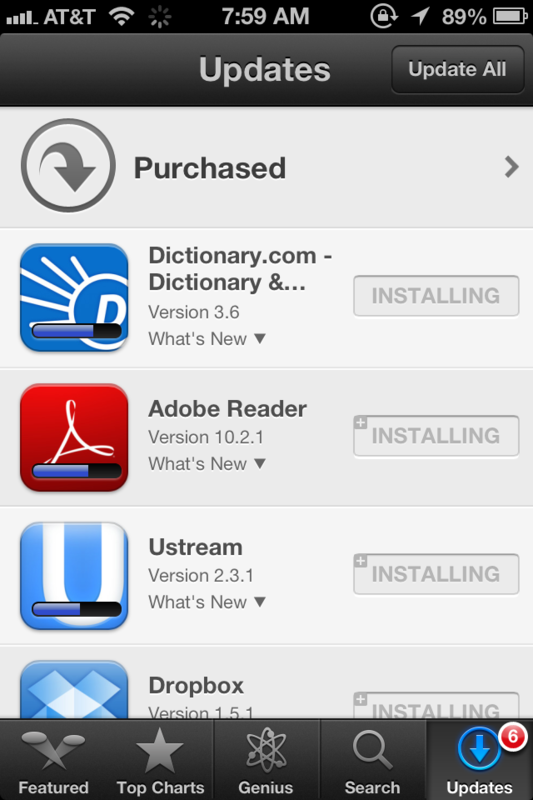 The app icon gives you a progress bar and the install button says installing. This helps me a ton because I like to update apps individually so I can read their list of recent changes and I can skip ones that I want to remember to review. You also do not have to enter your password for updating apps. This is a much needed feature, but for my use, this just isn’t enough. I would have liked automatic updates in the background (when charging for instance). My mother and father doesn’t get it why or how they update apps, no matter how often I show them. And I have over 800 apps among my iOS-devices… it gets tedious to update everything… Especially since when you push ‘update all’ it checks if it has enough space to update ALL the apps, which I don’t. If it had updated one or two apps at a time (or checked if it had enough space for each app) that would solve some of the problem at least. This fall I’m moving over to either android or windows phone 8 if the new iPhone isn’t REALLY impressive. Love the idea of auto updating apps, would it work the same way that the backup does, if you have selected backup to iCloud. This works when connected to wifi, on charge abd screen locked. The only time this might be so great is if the update adds new features, would be great for bug fixes and the inclusion of random languages. For new features I would like to read the update descriptions first to see what’s new. Perhaps if users could choose how to handle updates based on how the update description is tagged. So if the description is tagged “bug fixes” auto update for me and if it’s tagged “new features” let me read the blurb first.